Louis Bloom (Jake Gyllenhaal) is not a human being. He looks like one, or an approximation of one, anyway, but he isn't. The term "sociopath" doesn't do someone like Louis Bloom justice; not only does he not care about anyone or anything not directly connected to his agenda, they barely register as human beings at all to him. At best, they're objects he can manipulate, blackmail, or (in some instances), literally drag around to serve his purposes. We meet Louis Bloom as he assaults (possibly kills) someone who may or may not be a police officer / security guard and steals his watch - a visual metaphor that pops up periodically throughout Nightcrawler, as a reminder of sorts. Louis steals some construction equipment and some raw materials, and sells it to a scrapyard owner (Marco Rodriguez). While he's there, Louis makes his case that he should also be given a job, and doesn't quite register that the owner looks upon him with disdain. Only when he's told "I don't hire thieves," does Louis get the message and leaves. This is the protagonist of Dan Gilroy's Nightcrawler, the sort of film that makes one long for the days of decent antiheroes like Travis Bickle. It's certainly an interesting film, one that has a few rookie mistakes and a score that nearly cripples the film, but on the whole there's more to recommend than not. That is, as long as you don't mind spending two hours watching a "rags to riches" story where the scrappy young hero is replaced with a total psycho. It's a riveting performance from Gyllenhaal, and the rest of the cast is quite good as well, but I can't honestly say that I'm in any hurry to watch Nightcrawler again. There's a level of cynicism about humanity in Nightcrawler that makes the end of David Fincher's Gone Girl look like Pollyanna by comparison. And how Gilroy gets Louis from a low level scumbag to a truly frightening success story is by no means pleasant. By chance, Louis comes across an accident on the highway, and is subsequently introduced to the world of "nightcrawlers": independent videographers who shoot footage of crime scenes, accidents, or likewise grisly occurrences, and sell them to the highest bidder. Right after Louis pulls over, the van for Mayhem Productions pulls up, and the ever inquisitive Bloom grills Joe Loder (Bill Paxton) about what he does. An entrepreneur without a direction, Louis decides he has an objective, and will stop at nothing to be like Loder. Better than Loder. His people skills aren't great: Louis doesn't so much speak to people as he regurgitates business seminar talking points, applying them to himself as necessary. We don't know much about his life: he has an apartment with a TV and a plant, and beyond that, he's a cipher. It's not who Louis is, but what he's capable of doing that Gilroy is interested in showing us. In many ways, Nightcrawler follows the narrative structure of a "rags to riches" story almost exactly, only to horrifying ends. Louis buys a camera and a police scanner, makes mistakes, but eventually finds some usable footage and sells it to the lowest rated news channel in Los Angeles. He initiative impresses the news producer, Nina Romina (Renee Russo), although she has no idea what his real agenda is. He hires an intern, Rick (Riz Ahmed), a mostly homeless kid in desperate need of work, and relentlessly insults his inability to do exactly what Louis wants when he wants it. But they make it work: accident after accident, crime scene after crime scene, Louis builds his reputation. He's not above sneaking into somebody's house or moving evidence around for better shot composition. When he arrives at an accident before the police get there, Louis even moves a body in order to get more compelling footage. Ethics don't even factor into Bloom's world, much to the chagrin of KWLA's Frank Kruse (Kevin Rahm), the station director. At this point, we should probably be a little worried about where Nightcrawler is headed, although I will admit that I wasn't sure just how far down the rabbit hole we would be following Louis. He refuses an offer to join Mayhem Video and then goes one step further to insure his competition won't be around much longer. He arrives at a triple homicide before the killers have even left, and then spends time wandering around the house filming the bloody aftermath, and then withholds crucial evidence when detectives Frontieri (Michael Hyatt) and Liberman (Price Carson) track the news report to its source - Bloom's newly coined "Video Production Services," a "legitimate news source" as he demands Nina describe it to her anchors. His manipulation of Nina is arguably even worse, as he both emotionally and professionally blackmails her (the former off-camera but the latter very much in evidence onscreen). He takes umbrage to Rick negotiating a salary before a tense high speed chase, which leads us to the ultimate revelation of just how far Louis is willing to go to be the best nightcrawler in Los Angeles. Gilroy (The Bourne Legacy, The Fall), who wrote and makes his directorial debut with Nightcrawler, does a fine job of showcasing the actors in this seedy, underexplored portrait of LA. It's largely Gyllenhaal's show, but Russo and Ahmed in particular are very good as the dual sides to how an actual human being would react to someone like Louis Bloom. Other characters come and go without much impact - even Bill Paxton barely registers as "the competition," and while the film is technically sound, it often feels inert. Gilroy seems to come to life during the high speed chase towards the end of the film, but Nightcrawler is often too low key, relying on Gyllenhaal to carry the narrative forward, by hook or by crook. The level of cynicism on display calls for something perhaps a little showier, if I'm being honest. Not too much, but there are portions of the middle that drag and lack momentum. 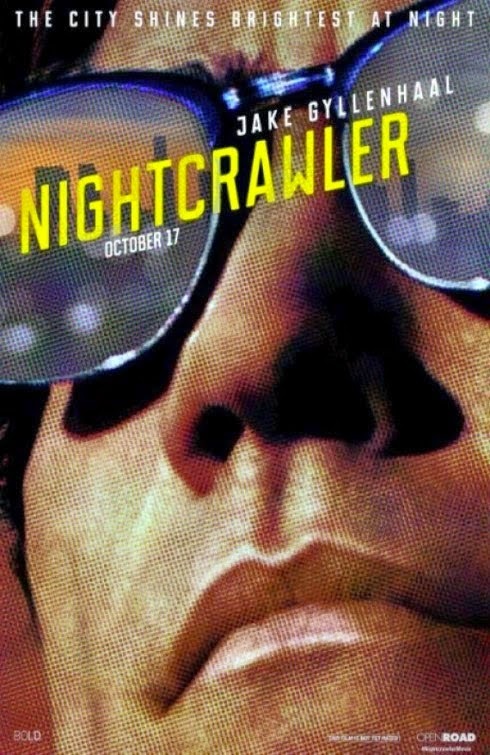 I wouldn't consider it unfair to compare Nightcrawler to another writer-turned-director debut, Robert D. Siegel (The Wrestler)'s Big Fan, which covers a similarly troubled protagonist, and is likewise an interesting watch but not a film I'd hurry to revisit. More problematic is the score by James Newton Howard (The Happening), which is often jarringly inappropriate. If the direction is low key to a fault, the score is too traditional: there's often no subtlety to the music, to the point I found it distracting at critical parts of the film. If it was meant to be a deliberate juxtaposition between the character beats and the traditional story structure, it doesn't succeed at all. And, barring that, if this is simply what Howard thought fit best with the footage in front of him, he failed completely. If ever a film called for minimalist scoring, it would be Nightcrawler (I have seen reviews that suggested something closer to Cliff Martinez's score to Drive would be more appropriate, and it's a fair point). If anything, the music hurts the film more than Gilroy stretching his wings as a director.